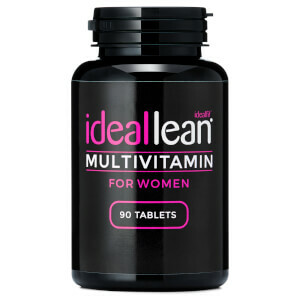 Why use IdealFit Pre-workout Supplement for Women? IdealFit pre-workout powder has been formulated specifically to aid your workout, training and overall performance. To do this our formulation combines a range of different ingredients including caffeine, citrulline malate, beta alanine, green tea, cla choline and more. We keep the caffeine in our pre workout natural & low enough so you won’t get the jitters or feel sick but still enough to contribute to increased alertness and to delay the onset of tiredness and fatigue! What’s more we’ve also added ingredients that are often taken by individuals who are looking to lose weight such as CLA, green tea extract and choline to contribute to macronutrient metabolism. But it doesn’t just stop there, because we want to specifically support females in fitness we’ve also included a comprehensive B vitamin complex for normal energy yielding metabolism. We recommend you take a scoop of our pre-workout with water around 15 minutes before training and get ready to try our amazing flavours including blue raspberry, cherry limeade and watermelon! Who can benefit from a pre-workout supplement? Our pre workout powder can be added to water to create a great tasting pre workout drink – perfect for those looking to aid their performance or increase energy. Pre-workout drinks containing caffeine together with vitamin B can contribute to mental performance and delay the onset of tiredness and fatigue which can be particularly beneficial for women looking to train before or after work. Added CLA, green tea extract and choline. Mix 10g of powder (1 scoop) with 300ml of cold water. Drink 20-30 minutes before your workout. To assess your tolerance, start with 1/2 scoop. Store in a cool, dry place away from sunlight. Once opened replace lid securely after use. For best before end date see lid of container. Suitable for vegetarians. This product should not be used to substitute a varied, balanced diet. Our products are not suitable for pregnant or breastfeeding women or children under the age of 18. Contains allura red which may have an adverse effect on the activity and attention of children. Contains caffeine (20 mg per 10g serving). Store out of reach of young children. If you have a pre-existing medical condition, seek medical advice before embarking on a meal or exercise plan. Beta Alanine, L-Citrulline DL Malate, Flavouring (Flavouring, Sweeteners (Sucralose, Acesulfame K), Colours (Allura Red)), L-Tyrosine, Calcium Carbonate, Choline Bitartrate, L–Theanine, Green Tea Extract, Phosphatidyl Serine (Phosphatidyl Serine, Soy Lecithin), Vitamin Blend (Pantothenic acid, Biotin, Vitamin B6, Vitamin B12, Thiamin, Riboflavin, Folic Acid, Niacin), Conjugated Linoleic Acid (Safflower Oil, Glucose Syrup, Sodium Caseinate (Milk)), Chromium Picolinate. This is a great pre-workout, it certainly gives me that boost I need at the start and throughout my whole 2 hour training sessions. It lives up to its name of watermelon ICE, it isn't overly sweet and it does taste like watermelon however it certainly packs a punch. My only downside is that it the tub is far far far too big for the amount of product you get, and that my order came all packed together so I had to use a knife to break it up and now it takes a little longer to dissolve, other than that it is great and I certainly recommend. A little to sweet but that does not bother me. It works perfectly! Best energy boost ever! Love this flavour, it tastes really well and gives me that added push and helps me have an amazing workout! Great, I have tried others that aren’t as pleasent to drink. This taste great and certainly helps me have a great work out. One thing to note is, I go tingly... kind of like pins and needles. After drinking it. This wears off as I am working out. First time trying this, highly recommend! tastes really good and helps you push through hard workouts. Received unusable. Despite the tube being sealed, I opened this to find the powder clumped together. I tried using a fork to break the powder up but it's completely unusable and complete waste of money. Tried this supplement for the first time, I was looking for suitable products for both women and sugar free as I'm a Type 1 diabetic. I'd been using a standard pre-workout designed for men but at between 1/3 and half the dose, but had concerns about long term use. Thought I would try this product, and ordered it in the watermelon flavour, initially started on the half dose as recommended, then found that it was so effective that I haven't needed to use the full dose as yet. The supplement enables a good level of concentration, focus and that extra boost for intensive training. Usual side effects of tingling/prickling, but short lived. Well recommended and will be buying again. It's so good the watermelon flavor works great without the jitters. I love it. !